(Last Updated : 08.04.19). 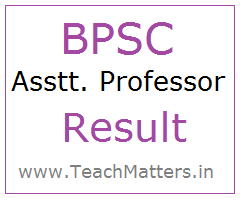 Check BPSC Assistant Professor Result 2019 Interview Schedule - Bihar Public Service Commission released Revised Result of Assistant Professor Botany (67/2014). Interview Letter can be downloaded seven days before the interview from the official website of BPSC i.e. www.bpsc.bih.nic.in. Candidates who have appeared in Bihar Assistant Professor Exam 2017-18 can check here latest updates on BPSC Assistant Professor Recruitment 2018-2019. Here you can check BPSC Assistant Professor Result 2019 Cut-off Marks, Interview Dates, Interview Admit Card, Final Result and Interview Marks. Latest Interview Result for Assistant Professor Hindi is released on 04.04.2019. Candidates who appeared in this exam can check the final result and selection list. Check here latest result and interview schedule for the post of Polytechnic Lecturer & Assistant Professor in Govt. Engineering Colleges under Science & Technology Department, Govt. of Bihar. Interview for Assistant Professor will be held as per the given schedule. Interview letters are available for Assistant Professor Interview 2019. Candidates can download their interview call letter from the official website of BPSC as per the schedule. Interview Letter for candidates for the post of Assistant Professor are available to download one one week before the interview. Download interview admit card now.